I did something different for this video…all screen. While it won’t be the norm, I occasionally like to sprinkle these types of videos in. If you are looking to boost your revenue as an affiliate marketer, then this is the right video for you. I’ll talk about which opportunities you should pursue to make the most sales and a hefty commission per sale. I talk about some of the tools that I am using to help out with my affiliate marketing process. How To Increase Your Affiliate Marketing Revenue. Create as much content as you want. You still have to market it. If you write enough blog posts, you become very comfortable with the experience. All I need is an outline about a topic I would enjoy writing about, and then I’m off to the races. Producing content eventually becomes effortless. However, if you want to turn content creation into a business, then you need to be prepared to put on your marketing hat. Creating the content is not the marketing. Create it, and no one may show up. Marketing can get very confusing very quickly. You think you are on the right path, and then all of a sudden, you get a curveball. It’s possible to achieve effortless marketing, but you have to treat marketing in the same way you would treat writing content and producing videos. You have to work on marketing your business every day. Some days will be easier than others, but if you pursue someone every day, you will eventually become a master at what you are pursuing. Putting on the marketing hat correctly means putting the marketing hat on and keeping it on for as long as possible. I sometimes find myself producing content without thinking about the marketing. I used think about marketing for a few days, grind at it, and then go back to spending my time only creating my content. Now I market my brand every day. Consistency is vital in everything that you do—especially with marketing. I feel like content creators have consistency down with their content, but the marketing consistency isn’t there at all. Now it’s time to get the marketing consistency down. When you identify the ways you will market your business, it’s always a rough draft. You’ll never have the final copy because you’ll keep on making changes to the draft. Identification will give you an idea of what needs to be done. The word “marketing” doesn’t indicate what workload you are going to embrace. Will you use social media marketing (which ones), email marketing, local marketing, or something else. Once you know what you must do, you can implement. During this identification process, write down all of the tactics you will use to market your brand. More specifically, what will you do EVERY DAY in order to achieve the results you are looking for? With all of this marketing, I’m sure that many content ideas will arise from your efforts. Setting goals with a deadline gives you more urgency to put in the work. If your goal doesn’t have a deadline, it’s probably not going to get accomplished. If you create a lot of content, then you are good at setting goals with a deadline. Chances are you have a blog or YouTube channel that must have at least one piece of new content every week/month. The consistency grabs your attention. Forgetting to write and schedule a blog post for a given day would be devastating. We need to think about marketing in the same way. To not market your brand on a given day must possess the same feeling of devastation as forgetting to write and schedule a blog post. One important thing about setting goals is that you must make them attainable. If you set a goal that is impossible for you to reach, then you may get discouraged right from the beginning. In the beginning, set a goal for yourself that is very easy to reach, and then gradually rise your standards. I wish I could accomplish a goal just by writing it down. Writing the goal down significantly helps out with goal achievement, but you have to put in the work. Putting in the work is an obvious need for goal achievement, but what type of work do you have to put in? The answer to that question comes with research. If you want to grow your email list, you would go on Google and type in phrases like “How to grow an email list.” Then immerse yourself in as many email list growth related articles as possible. Make this research a daily habit. That way, your knowledge will expand—and this knowledge will be SPECIFICALLY RELATED to the goal that you are trying to achieve. And this is knowledge that will actually be worthwhile—unlike other forms of knowledge. Only the implemented, relevant knowledge is power. After you have the rough draft (plan) and have done the research, it’s time to take action. Some parts of your marketing will be flawless, other parts will be beyond your expectations, and there will be some duds. That’s one of the universal truths about all of marketing. But the only way you determine which tactics are good is by experimentation. The most important part of experimenting with your marketing is that you must have data. The data lets you know exactly how successful or unsuccessful one of your tactics is. You should experiment with at least one marketing tactic per day. That way, you’ll learn more things about how to most effectively market your products and services. With that said, you don’t want to take experimentation too far. Each change an individual product or service receives should be at least two weeks separated from another change. Here’s an example. Let’s say you have a Kindle book that is getting two sales per day. You decide to change the description and the book’s cover at the same time. You analyze the results a month later and discover that your book is still averaging two sales per day. What if changing the cover doubled your sales, but changing the description cut your sales in half? Or vice-versa? The problem is that you can’t tell. You have no idea what those two changes did to your book sales. If you have two Kindle books, you can change the cover for one of those books and then change the description for the other book. The key thing is to experiment every day, but at the same time, you don’t want to over experiment to the point where you can’t tell what changes with each new variable (i.e. changing the book cover, changing the description, etc). When you have mastered a certain marketing tactic, it’s time for you to outsource the work. With the mastery, you can easily explain to a freelancer what type of marketing needs to get done. There’s a smaller chance of error, and if the freelancer is a dud, you can still do the work until you find another freelancer. Outsourcing some of your marketing is important because outsourcing opens up extra time. With the extra time, you can experiment with more marketing tactics and analyze the results. As you continue to master more marketing tactics and outsource them, your brand will start growing exponentially. At a certain point, all of the marketing you do will put your content into the hands of thousands of people who would love to share your content. Now you have a free army of people who will promote your content for you. The Huffington Post, BuzzFeed, and Mashable among others have done a great job at putting their content in front of people who would love to share that content with their audiences. Content creators know how to consistently put out new content. Now, it’s time to consistently wear our marketing hats and put our content in front of people who would love to share it. What are your thoughts about marketing? Have any tips for us? Sound off in the comments section below. Every time someone enters their email address into your opt-in box, they get sent over to a thank you page. Most thank you pages let people know how they can access the freebie they were promised. However, people are incredibly savvy these days. Getting access to any freebie is just a matter of going to the inbox and reading the automated welcome email. So why do we continue providing something on the thank you page that people will get in their inbox anyway? Beats me. I do this for some of my landing pages to this day because of all of the social proof the thank you pages have received. My newer landing pages redirect people to something very, very different. And I make more money because of this decision. Watch the video to learn more. How To Get More Sales With A Custom Thank You Page. Affiliate marketing alone presents its set of advantages and disadvantages. The main advantage is you get to earn a commission by promoting products that other people created. Sometimes, the product creators will even provide you with copy that converts well. The main disadvantage is that relying too much on affiliate marketing makes you dependent on other people creating products and putting you in their affiliate networks. For most of my journey, I haven’t given affiliate marketing much thought. I started off as an Amazon Associate, and after making only 4-6% commissions for each product sale, I thought affiliate marketing would never be my cup of hot chocolate (I not a big fan of tea). Then, I randomly got an email from an affiliate marketer. This affiliate marketer gave me the opportunity to promote a copywriting training course and get 40% of the commission for every sale. Since the course was high-end, each sale I got as an affiliate brought in over $100. I was immediately sold and decided to give affiliate marketing a second try. Now, it’s slowly growing into a big part of my business. As I started to explore affiliate marketing, I paid more attention to other affiliate marketing promotions. I noticed that many of the people who created successful products of their own were also affiliate marketers. How does that happen? The answer is that it can take a very long time to create a product. For some people, it takes them several months just to create a new product that is bound to perform well. Mega training courses for instance can have over 10 hours of video with complementary PDFs, quizzes, and other interactive activities. And for many successful products, the time spent towards marketing usually exceeds the time spent towards creating the actual product. Call it crazy, but that’s how it works. While these people are creating their products, how do they make money? The revenue they generate usually comes from their old products but also through affiliate marketing. I am an ambitious teenager but schedule conflicts are part of the norm. I anticipate on creating one mini training course on Udemy every week. Sometimes I accomplish that goal. At other times, the amount of homework and upcoming tests prevents me from reaching that goal. When it comes to product creation, time will not always be on your side. As an affiliate marketer, time is always on your side. Even if you don’t get many sales from one of your affiliate offers, you can always search out the next affiliate offer. Now that you know why affiliate marketing can potentially bring in revenue, I am going to share with you how you can generate revenue from a powerful affiliate marketing strategy. Most people are introduced to affiliate marketing for the first time when they become Amazon Associates. It’s one of the largest affiliate network known to mankind, and you have millions of products to choose from. The only problem is that most people only get a 4% commission rate for their efforts. The reason I went back to affiliate marketing was because I started to make real money. I’m not talking about the 4% rate that Amazon provides. I am talking about making over $100 just for making one sale. Sell 10 of those products every month and you make over $1,000 every month. The math is as simple as that. When you have a lower commission per sale, you need more sales to reach the same milestones. If you get a $5 commission for each product you sell, you would have to sell 200 products to make $1,000. For the product with the $100 commission, you only need to sell 10 of those products. In most cases, it is easier to get 10 sales of the same product than it is to get 200 sales of the same product, regardless of price. The best part about some affiliate networks is that you may be provided with email blasts, social media posts, and sales pages that convert well above the average sales page. I was an affiliate for Ray Edwards’ Copywriting Academy course. As a part of his affiliate network, I was provided with email blasts that were designed to convert far beyond the average. Basically, he knows more than me about getting sales. I promoted his videos and webinars that led up to the course. Then I promoted the course itself. His sales pages are some of the most optimized sales pages out there. Getting some of my visitors to that sales page resulted in more revenue for Ray and me. The best part is that the people who bought the course are going to learn a lot about copywriting and making more sales. And I did no work. I just copied and pasted a few messages and sent them out accordingly. Ray put together the entire product, the entire sales page, and everything else along with it. In the end, Ray made far more revenue than me from his product launch, but I got my fair share too. The way you promote your affiliate links depends on where those affiliate links lead your visitors. When promoting Copywriting Academy, I had links to videos and webinars that required an email address in order for the visitor to gain access to the video/webinar. I tweeted these links but never tweeted the link to the sales page (Twitter isn’t the place to promote the sales page of a product, especially high-end products. People rarely go on Twitter thinking “What will I buy next?”). Most of the clicks I got from my affiliate links were directly from Twitter. In the end, over 5,000 people clicked on the link and over 100 people opted in. The final result was one sale and I made over $100 from that one sale. That commission for one product sale is way better than any Amazon affiliate link. Some people make six figures from affiliate marketing alone. While you shouldn’t rely on affiliate marketing for your income, it can still be quite profitable. I believe in making a profit and having a high net income. I also believe in efficiently spending money. I don’t buy many things for myself with my own money. When I spend money, I spend it on my business. I spend it on online advertising. AdWords and Facebook ads in particular. My goal is to grow my audience exponentially. Spending money on online advertising helps with that. YouTube is the next social network I am taking seriously. I want to leverage that platform and create videos more often. Eventually, I want to have more videos on my YouTube channel than blog posts on this blog. 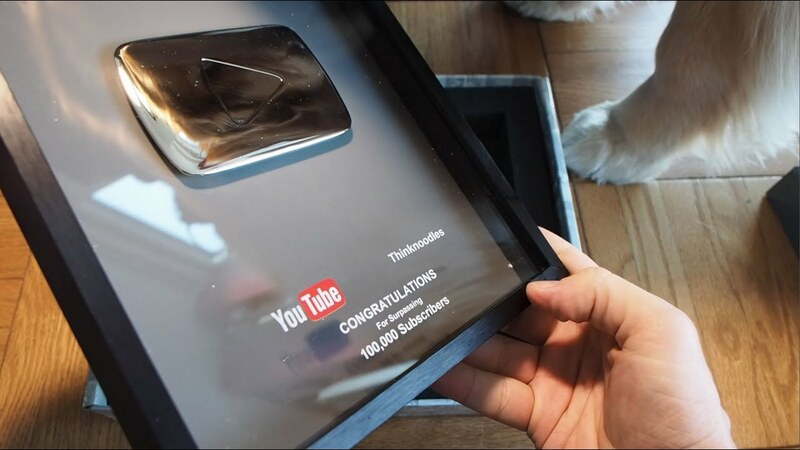 Oh, and I want this awesome YouTube trophy. When I identified YouTube as the next social network to work on, I knew that my current approach wasn’t working. At just 2,500 subscribers, I knew I needed to make massive changes to get to 100,000 subscribers. It’s still a goal of mine, but I am taking action—by investing in online advertising. I decided to run an ad with AdWords and see what that would do to my channel views. I started off at a budget of $3/day. Not much, but I just wanted to see what types of results I would get. I was getting targeted views, and I was paying $0.01 for one view. My video promoting my writing course suddenly went from getting zero views to getting over 300 views every day. I only repurposed $3/day from my revenue, and I am growing my platform. But if you frequently visit this blog, then you know the most important platform of all. The email list. Entrepreneurs are spending more time and money trying to master online advertising because it can be highly profitable. Consider this: Every email list has a certain number of subscribers on it. When you make money from your email list, each subscriber, when averaged with the others, results in a certain amount of revenue. If you have 100 subscribers and make $200 from a promotion, each subscriber (on average) results in $2 for you. Let’s say that rate of making $2 per subscriber remains constant, and you discover a method where you can spend $1 to get one new subscriber. No matter how much money you spend, you are going to make a profit. This dream of exponential profits inspires people to invest their time and money into online advertising. Ever notice an opportunity that was right there the entire time? That’s what recently happened to me. Udemy has become the main focus in my business strategy, and it’s paying off. Since I made that decision, my revenue from Udemy has significantly increased. It didn’t take much of an investigation to determine most of the revenue I made came from my own promotion. What I didn’t initially realize is that affiliate promotions also contributed to my revenue increase. The great thing about Udemy is that they have an affiliate program set up for you. All you have to do is give people the affiliate links to your courses and then they can start promoting them. Your affiliates get paid without your involvement, and you get a slice of the pie too. So I decided to let people know about Udemy’s affiliate program. In all of my courses, I included a document with affiliate links to my courses. My students now have the option to promote my courses, make money for themselves, and then some of that money comes back to me. Don’t think you have to make all of the sales by yourself. It’s okay to have a team of people who help you. Even if that means sharing some of the money. Affiliate marketing is huge. It’s not the holy grail, but it is valuable nevertheless. If you find yourself struggling to create products at a rapid pace, affiliate marketing gives you a product to promote. I didn’t put together the Copywriting Academy course. But I made money by promoting the course as an affiliate. That’s affiliate marketing in a nutshell. What are your thoughts on affiliate marketing? Are you a part of an affiliate program? Do you have any affiliate marketing tips for us? Want to promote one of my courses? Sound off in the comments section below. Today’s marketplace is constantly expanding. Just a decade ago, it was difficult to publish your own book. Nowadays, anyone can self-publish a book in a matter of minutes with KDP. Technology has virtually wiped out the barrier of entry for most industries. Business owners can now enter the marketplace and grow a large audience without paying a single penny. For less than $150 per year, I grew my Twitter audience to over 250,000 people. You don’t need advertising dollars to stand out in today’s marketplace. While they help, they are not needed. However, the ease of entering the marketplace has resulted in an outpour of experts. Blogging is one of the main reasons why the barrier of entry is so low. You can create a free blog on WordPress in a matter of minutes. It’s easy to get started. The challenge is standing out. The main reason some blogs stand out more than others is because of fantastic content. With that said, I understand that a larger audience gives a blog more leverage. However, to accumulate a large audience of returning visitors, the content must be fantastic. We all have a favorite blog. We return to that favorite blog because the content is fantastic. When I become a returning visitor, I’m not returning just so a system can tally me as another visitor. I am returning because the blog posts fascinate me. I always find myself returning to Seth Godin’s blog. Most of his blog posts are thought provoking and quick reads. In “The interim strategy,” Seth Godin brings one major point home: a great organization must start great and never cut corners in the beginning just for quick success. Stay on his blog long enough, and you’ll find yourself reading dozens of his blog posts trying to catch up with what you missed. I understand this sounds similar to writing fantastic content. It sounds as if the only difference is that I’m talking about videos instead of blog posts. However, videos are huge on the web. The average video gets more engagement than the average blog post. So does that mean give up writing blog posts all together? Blog posts can easily be edited and revised while you type. In a video, you are put on the spot. While you can do a redo, it’s much easier when writing a blog post. Writing a blog post in my opinion doesn’t require as much energy. Typing is easier than talking and barely stopping. I can type, stop, and think. That luxury is only available for videos by splicing and editing. Videos get more engagement than blog posts. Writing blog posts about something strengthens your skill in that area. Strengthening your skill makes it easier to do awesome videos. I wrote hundreds of blog posts to strengthen my knowledge before I did my first video. Creating videos is commonly associated with putting them on YouTube and getting subscribers from there. However, you can also create videos that you put into a training course. From my experience, creating a training course is quicker than writing a book. With speed on your side, you can create high value products at a higher frequency. To be successful in your niche, you must meaningfully put yourself in front of your targeted audience. Whether you put your blog posts, videos, or something else in front of your targeted audience, it must be something that positively grabs your targeted audience’s attention. To be everywhere your targeted audience goes, you must first know where your targeted audience goes. Are they reading Inc Magazine? Are they on this blog right now? Are they reading celebrity blogs? Are most of them on Twitter? The places where your audience goes are the places your content and videos must show up. Ask bloggers in your niche if they take guest posts. Submit that application to Inc Magazine again and again until they say yes (preferably get other writing opportunities first. Inc Magazine wants writers with solid experience). Partner up with people in your niche to reach new audiences. It turns out Jeff’s content has been featured on many prominent guest blogs. He has also been featured on The Huffington Post, Forbes, and a few others for his social media savvy. When the event organizer said he/she say Jeff everywhere, it wasn’t an exaggeration—to a certain extent. Jeff didn’t get featured on a celebrity site. He got featured on most of the blogs and top magazines about business and digital marketing. As people see you more often, and they appreciate your content each time, they will remember you. It’s hard to forget about the blogger you see dozens (or hundreds) of times on the web. Not only do expert interviews make the host and guest look good, but they also contribute to a larger audience. The guest usually promotes the interview or podcast episode on the day it gets published. That means more visibility for the host. The host repeats the process a few hundred times and the results multiply. New listeners watch/read the past interviews. The more of this interviews you are a part of (as the host or the guest), the more interviews you get. Hosts of podcasts see how well you can answer questions, and then they choose you as their next guest. Notable experts ask if they can be guests on your podcast. It’s this ripple effect that has allowed some podcasters to accumulate six figures every month and attract millions of people to their episodes. Writing a book is challenging the first time. Making a book successful the first time is more challenging. For all successful products, the marketing side is more challenging than the creation side. Why would a successful book make a big difference? Take a look at the people event organizers choose for public speaking events. Most of the speakers have a successful book. If they don’t have a successful book, then they have a massive amount of social proof. Some speakers have both. Writing a successful book shouldn’t be on the top of your list of things to do (unless you are a passionate writer). You need to accumulate a large audience so when it comes time to promoting your book, you can rest assured it will get plenty of sales. Making your audience feel special is the difference between any audience and a cult-style audience. Engage with them on Twitter. Build relationships in the most meaningful way you can think of. Random acts of kindness and random gifts—no matter how big or small—can go a long way. There is one true fact about every successful blogger, singer, baseball player, and President (in a word, every successful person). All of the individuals within the audience make the success happen. Recognizing this success will let you realize how important the people in your audience are. Random acts of kindness and random gifts aren’t suggestions. They’re mandates for building a cult-style audience. Your mission affects the way people see your brand. Let’s say two people offer Twitter courses at the same price, and they are virtually the same. One person’s stated mission is to make money. The other person’s stated mission is to give everyone the ability to become successful on Twitter. The person with the better mission. Of course, we know why the person who wants to simply make money won’t get the sale. However, we’ve become smart at crafting great mission statements. The most powerful mission statements have the biggest impact on sales. Take a look at the people in your niche who experience the most success. Then look for their mission statements. Some will state their mission statements right from the start. For others, it takes some digging in the About Me page to find someone’s mission statement. The mission statement is a starting point, not a final end. The mission statement implants a thought into a visitor’s mind. If that person sees your mission statement driving your journey and content, then the mission statement is valuable. Creating a mission statement that doesn’t support what you do is the quickest way to disaster. Standing out in an ever expanding playing field isn’t easy. There will be great struggles but also great triumphs along the way. Providing value in what you do, getting a large amount of people to respond that value (visiting, subscribing, purchasing, etc. ), and having an authentic mission statement is how you dominate your industry. What tips do you have for standing out in today’s marketplace? Which of these tips was your favorite? Do you believe it’s better to fight against competitors or work with competitors? Sound off in the comments section now! Does Temporarily Offering Paid Books and Training Courses For Free Really Generate A Profit? To offer a product for free or not to offer a product for free. With all of the articles on the web, people experimenting with free offers, and skeptics, it seems as if this debate could continue until the end of time. I heard both sides of the argument ever since I created my first product, and I continue hearing both sides of the argument to this day. The argument against temporarily offering paid books and training courses free of charge is that you don’t make money for any of those sales. 2,000 people could get your free book or training course that you normally charge for, but you won’t make as much money compared to if one person bought the paid book or training course. The supporting argument for temporarily offering paid books and training courses free of charge is that you generate social proof and make your product look more enticing when the free offer expires. Many Udemy instructors offer their courses for free in the beginning to get thousands of students because having thousands of students looks better than only having five students, even if they initially don’t make as much money that way. Some of the people who get your book or training course free of charge may decide to leave reviews that positively impact the way your product looks in the marketplace. I heard both sides of the argument for so long that I didn’t fully know which side to believe. There are articles on the web from both sides of the argument that present valid case studies and earning reports. Putting my first product on the web meant putting a price tag on it, but as I created more products, I needed to discover whether I would make some of them temporarily free or not even think about doing so. The only way to know whether something works or not is by giving it a try, so for some of my products, I decided to temporarily remove the price tag for one of my products. Removing the price tag would remove the uncertainty in a matter of days, but making one of my products temporarily free for the first time scared me. People told me not to do it, but the feeling of uncertainty was too overwhelming. I just had to give it a try so I could finally decide once and for all of it even works. What initially started as a “Let’s try it just for the sake of trying it” plan has now become essential. Offering my product for free allowed it to get more customers than ever before. Making the product free meant no profit, but I didn’t lose anything either. Offering an online product free of charge eliminates the need of shipping and production costs. When you temporarily offer a product free of charge, you aren’t looking to make money from this promotion. That sounds obvious, but many people forget that for the particular promotion, revenue isn’t the primary objective. The primary objective in your promotional efforts for a temporarily free product is to generate social proof. You want people to leave reviews for your product so that when the price tags return and your product is no longer free, it will look better in the marketplace. The Udemy course with 2,000 students and over 10 reviews looks better than the Udemy course with 10 students and no reviews. Social proof was always important, but now it is more important than ever before. The idea of getting social proof by temporarily making a product free of charge makes free promotions seem like investments. If you invest money in the stock market, you hope to make a profit in return. Temporarily offering a product for free works in a slightly different manner. For online products, you don’t invest money to make a product free of charge because the act of providing someone with the product does not cost you a penny. You neither lose nor gain a profit by temporarily making a product free of charge. What you invest in this case is your time. It takes time to promote a product. Some people see finishing a product as completing the entire battle, but that is only half of the battle. Marketing a product to get numerous sales in the marketplace is just as challenging as actually creating the product. Just because you offer a sweet deal and temporarily make one of your products free does not mean people will flock over to your free product. People have to know about the free product first. Once people know about your offer and get your free product, a relationship starts to build. The relationship you build between you and the customer is essential towards getting good reviews. At the end of my Udemy lectures, I make it a point to encourage interaction. I encourage interaction so people’s questions can get answered and so I can know my audience better. Knowing my audience better allows me to build stronger relationships which lead to reviews, and I get a better idea of what type of products my targeted audiences wants. Knowing what products your targeted audience wants and then creating those products is a great way to generate more sales. When I temporarily offered my product free of charge, I didn’t make any money for that product for the entire free promotion. For all of my products, once the free promotion ended, I always got a significant increase in sales. Now, when one of my products does not generate as many sales as it did in the past, I sometimes make the product free to get more buzz which helps the product succeed as a whole. You must avoid making your products free too often because people will then avoid buying your products and simply wait for the free promotions. The phrase “too often” depends on the niche you are in and how many free promotions your competitors do. Utilizing these three outlets allowed me to successfully promote my product while it was free. All of the promotion led to thousands of new customers and dozens of reviews in less than a month. What are your thoughts about free product promotions? Did you promote one of your paid products and temporarily make it free? What are your tips for promoting a temporarily free product? Please share your thoughts and advice below.